3 Exeter is located on the west side of Exeter, between Beacon and Marlborough, with 1 Exeter to the north and 5 Exeter to the south. 3 Exeter was built ca. 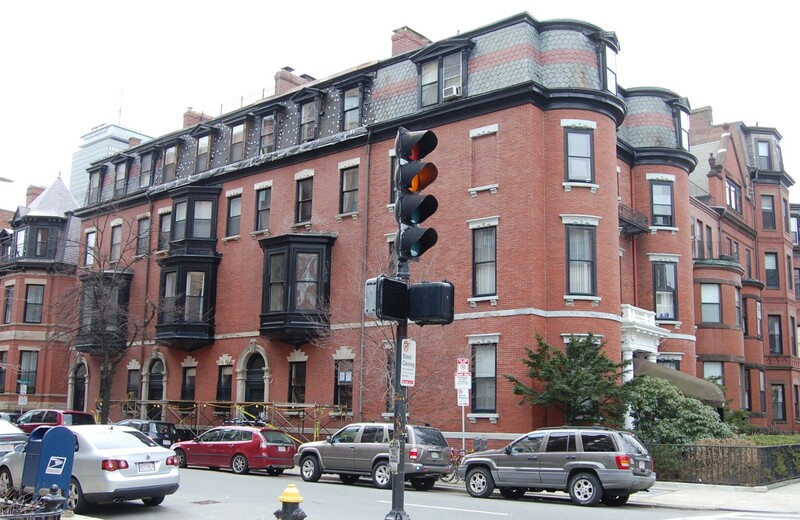 1870 for building contractor George Wheatland, Jr., for speculative sale, one of four contiguous houses (1-3-5 Exeter and 299 Beacon) which form a single unit between Beacon Street and Public Alley 417. Click here for an index to the deeds for 3 Exeter. On June 27, 1870, 3 Exeter was purchased from George Wheatland, Jr., by Abigail (Abby) Williams May, a noted abolitionist and advocate for women’s suffrage. Living with her were her mother, Mary (Goddard) May, the widow of Samuel Joseph May, and her niece, Eleanor Goddard May (daughter of Frederick Warren Goddard May). They all previously had lived at 27 Hollis. Mary (Goddard) May died in March of 1882. Abigail May lived at 3 Exeter until her death in November of 1888. Eleanor Goddard May inherited 3 Exeter from her aunt. She continued to live there during the 1888-1889 winter season, but moved thereafter to the Hotel Ilkley on Huntington at Cumberland. On May 24, 1889, 3 Exeter was purchased from Eleanor May by Mary Ruth (Channing) Eustis, the widow of Frederick Augustus Eustis. She lived in Milton. On September 5, 1889, she transferred the property to Charles Henry Parker as trustee for the benefit of her daughter, Emily Augusta Eustis. Emily Eustis married later that month to Dr. John Amory Jeffries, a physician, and 3 Exeter became their home. Prior to their marriage, John Jeffries lived at 126 Beacon with his parents, John and Anna Lloyd (Greene) Jeffries. John Jeffries died in March of 1892. 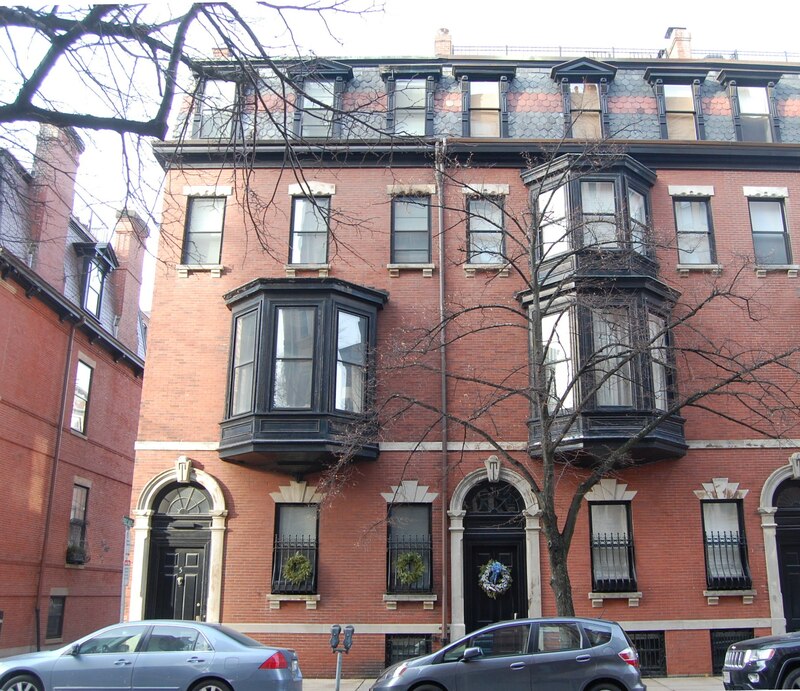 Emily Jeffries continued to live at 3 Exeter during the 1896-1897 winter season, but was living elsewhere (probably traveling) during the next two seasons. During the 1897-1898 winter season, 1 Exeter was the home of Dr. Algernon Sidney Coolidge, Jr., a physician, and his wife, Amy Peabody (Lothrop) Coolidge. Prior to their marriage in December of 1896, he had lived next door at 1 Exeter, where he continued to maintain his offices after moving to 3 Exeter. The Coolidges lived at 3 Exeter while their home at 487 Commonwealth was being built. They had moved there by 1899. 3 Exeter was not listed in the 1899 Blue Book. Emily Jeffries was living at 3 Exeter once again by the 1899-1900 winter season. She remained there through the 1903-1904 winter season. By 1906, she had moved to the Hotel Agassiz at 191 Commonwealth. During the 1904-1905 winter season, 3 Exeter was the home of attorney Henry Morse Channing and his wife, Katharine (Minot) Channing. They had married in November of 1904 and 3 Exeter probably was their first home together. They also maintained a home in Sherborn. 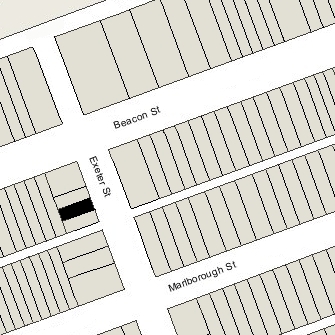 By the 1905-1906 season, they had moved to 142 Marlborough. In 1906, 3 Exeter was the home of attorney Charles Benjamin Barnes, Jr., and his wife, Josephine Lea (Low) Barnes. They previously had lived at 301 Beacon. They also maintained a home in Hingham. By 1907, they had moved to 217 Beacon. On July 5, 1906, 3 Exeter was purchased from Emily Jeffries’s trust by Dr. Cecil Porter Wilson, a dentist. He and his wife, Caroline Josephine (Nourse) Wilson, made it their home. They previously had lived at the Hotel Agassiz at 191 Commonwealth. They continued to live at 3 Exeter during the 1914-1915 winter season, but moved thereafter. By the 1915-1916 winter season, it was the home of Horace Morison, a real estate trustee, and his wife, Arria Frazer (Cotton) Morison. They previously had lived at 3 Louisburg Square. They also maintained a home in Peterboro, New Hampshire. 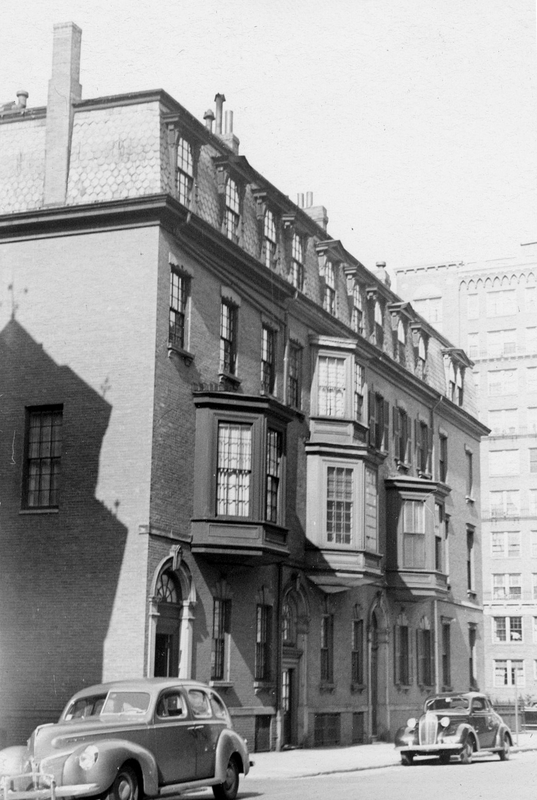 By 1917, they had moved back to 3 Louisburg Square. 3 Exeter was not listed in the 1918 Blue Book. During the 1918-1918 winter season, 3 Exeter was the home of Anna (Russell) Apthorp, the widow of Harrison Otis Apthorp, former headmaster of Milton Academy. Their two children, Harrison Otis Apthorp, III, who was an ensign in the US Navy, and Sarah Forbes Apthorp, lived with her. Their primary residence was in Milton. During the 1919-1920 winter season, 3 Exeter was the home of hemp merchant Richard Harding Weld, Jr., and his wife, Bertha R. (Eldridge) Weld. They had married in June of 1919, before which he had lived at 109 Beacon with his mother, Laura Townsend (Winsor) Weld, the widow of Richard Harding Weld. Richard Weld died in July of 1920 at their summer home in Harwichport. Bertha Weld moved from 3 Exeter soon thereafter. On August 30, 1920, 3 Exeter was purchased from Cecil Wilson by Henry Bancroft Sprague, treasurer of the Roxbury Carpet Company, He and his wife, Louise (Hill) Sprague, made it their home. They previously had lived at 182 Bay State Road, and before that at 319 Dartmouth. 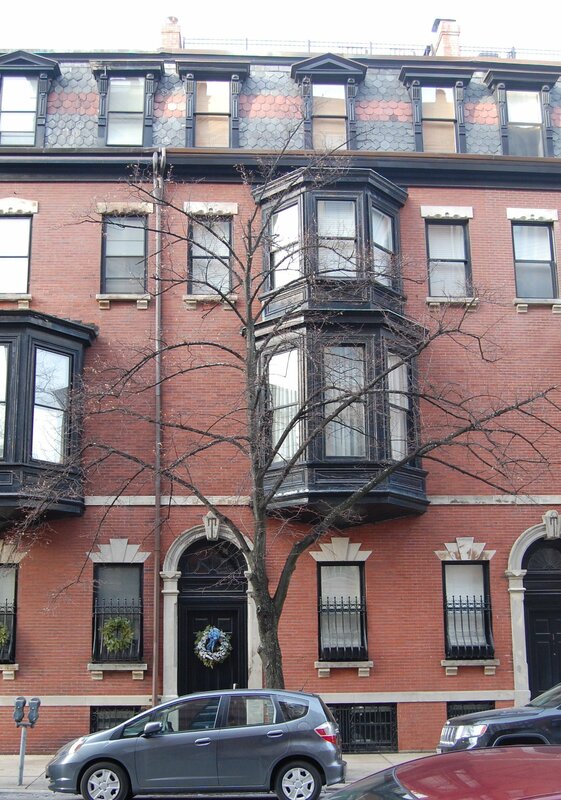 They continued to live at 3 Exeter during the 1926-1927 winter season, but moved thereafter to Brookline. 3 Exeter was not listed in the 1928 Blue Book. On February 17, 1928, 3 Exeter was acquired from Henry B. Sprague by Katharine (Minot) Channing, the wife of attorney Henry Morse Channing. The Channings had lived at 3 Exeter during the 1904-1905 winter season when they were newly married. They also maintained a home in Sherborn. In May of 1928, Katharine Channing filed for (and subsequently received) permission to construct a “new entrance to basement at front” and add a new window on the third floor (probably above the existing oriel window, resulting in a two-story oriel), add a penthouse, and make various interior alterations. The remodeling was designed by architects Howe, Manning, and Almy. The house was not listed in the 1929 Boston Blue Book, probably because of the construction being done, and the Channings spent the season at their home in Sherborn. By the 1929-1930 winter season, 3 Exeter had become the Channings’ home. In the mid-1940s, they were joined there by their son and daughter-in-law, Laurence Minot Channing and Mary (Carter) Channing. He was a lawyer in his father’s firm. They continued to live there until about 1948. They also continued to maintain their home in Sherborn and another home in Wareham. On July 13, 1948, 3 Exeter was purchased from Katharine Channing by Arthur Green Brick, a salesman, and his wife, Alice Genevieve (Weeks) MacMahon Brick. They previously had lived in Lexington. In January of 1953, he filed for (and subsequently received) permission to convert the property from a single-family dwelling into a single-family dwelling and lodging house. They continued to live there until about 1953. The property subsequently changed hands and on December 2, 1968, was acquired by Henry Evan Cockshutt Schulman. In February of 1988, he filed for (and subsequently received) permission to convert the property from a single-family dwelling and lodging house into a two-family dwelling. On November 2, 1999, Evan Schulman transferred the property to himself and Glorianna Davenport as a joint tenants. The property changed hands, remaining a two-family dwelling in 2016.